“You can not give enough credit to Ben Roethlisberger either – came in with a bad foot, blew his nose up in the first few plays, hung in there the entire night – great performance. What a football game!” — NBC Sports NFL football color announcer Cris Collinsworth during the game. “I look like I just went 12 rounds with [Manny] Pacquiao.” — Ben, after the game. The Steelers and Ben Roethlisberger got punched in the nose early, then rallied for a 13-10 victory over Baltimore on Sunday night. In a battle this physical, it was only fitting that the game turned on a defensive play. Troy Polamalu sacked Ravens quarterback Joe Flacco late in the fourth quarter and the Steelers recovered the ball for a first down inside the 10-yard line. They converted the turnover into Isaac Redman’s bruising nine-yard touchdown catch with about three minutes left, taking the 13-10 lead — their first advantage of the game. Roethlisberger passed for 253 yards, most of them coming after his nose was broken by a blow in the first quarter. “People like to call him a ‘drama queen’, but you know what? He’s one tough dude.” — NBC Sports NFL game announcer Al Michaels during the game. Despite an aggravated broken foot and a bloody, broken nose twisted awkwardly into a strange shape, Pittsburgh Steelers quarterback Ben Roethlisberger refused to lose. The gritty signal caller engineered a critical 13-10 comeback victory over the Baltimore Ravens on Sunday night at M&T Bank Stadium, propelling his team into sole possession of first place atop the AFC North. The Steelers were led by Roethlisberger, who threw the game-winning touchdown pass to fullback Isaac Redman in the final minutes of the fourth quarter. 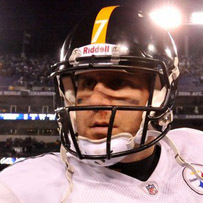 “Sometime in the first half, I got hit in the face,” Roethlisberger said. “I didn’t even realize it was that bad until I went over to the sidelines and guys were looking at me funny. ..
“I looked real quick. It hopefully will be fixed tomorrow. What about the broken foot? “It hurt a lot, but that broken nose took some of the pain away,” Roethlisberger said. The Ravens tipped their hats to Roethlisberger, extremely respectful of his toughness and ability. “Ben’s a warrior. He’s a winner. He gives us a great chance to win every time. I love the way he plays. We really had a lot of injuries out there tonight, and we just hung in there.” — Hines Ward during his post-game interview. Troy Polamalu provided Ben Roethlisberger another chance to beat the Baltimore Ravens, and Pittsburgh’s battered quarterback did just that. Roethlisberger threw a nine-yard touchdown pass to Isaac Redman with 2:51 left after Polamalu forced a fumble with a sack of Joe Flacco, and the Steelers beat the Ravens 13-10 Sunday night to gain sole possession of first place in the AFC North. Playing with a sprained right foot and overcoming a fierce pass rush, Roethlisberger went 22 for 38 for 253 yards. He has won six straight starts against Baltimore and is 8-2 lifetime against the Ravens. Both starting tight ends were knocked out of the game. Baltimore’s Todd Heap strained a hamstring on the first play from scrimmage and did not return, and Pittsburgh’s Heath Miller suffered a concussion in the third quarter in a collision with Ravens cornerback Chris Carr. The Steelers also lost right tackle Flozell Adams, who limped off the field in the third quarter. The hitting was so hard that even Pittsburgh’s punter got injured. Daniel Sepulveda hurt his right knee in the second quarter, and placekicker Shaun Suisham was called upon to punt for the remainder of the game. “Ben Roethlisberger, you have to give him credit – with all that he’s been through to stand in there and play the way he played today for that football team says a great deal to his football team, to the organization, to the whole city – ‘I am committed and I am here to play for this football team.’ He deserves some love for the way he battled today.” — NFL HOF player and NFL Network analyst Michael Irvin. Bloodied but unbowed, Ben Roethlisberger yet again found a way to beat the Steelers’ biggest rival. “We came in here and did what we needed to do,” linebacker James Harrison said. Roethlisberger improved to 8-2 against the Ravens despite playing on a bad foot and through an inadvertent hit to his nose early in the game. The Steelers didn’t get much out of their offense in the first half as Roethlisberger struggled with his accuracy. That changed in the second half when the Steelers went to the no-huddle. “We were able to move the ball downfield,” Roethlisberger said. “He’s a warrior, that guy is tough as nails. I have a lot of respect for Ben Roethlisberger.” — Former NFL quarterback and ESPN football analyst Trent Dilfer, SportsCenter. When there are 22 Pro Bowlers along with three former defensive players of the year on one field together, you can expect the game to be a serious throwdown. That was exactly the case Sunday night when the Steelers and Ravens met at M&T Bank Stadium in Baltimore with the AFC North lead on the line. Roethlisberger, though bloodied, did not miss a snap. He finished 22 of 38 passing and one TD, which came with just 2:51 left in the fourth quarter — Roethlisberger hit Isaac Redman on a short crossing pattern, and Redman fought his way into the end zone from nine yards out, securing the Pittsburgh victory. “That’s Ben. We expect that from him, not that it’s unappreciated. It is. But we expect it from him, and he expects it from himself.” – Coach Tomlin during his post-game press conference. Ben completed 22 of 38 passes for 253 yards, had one touchdown and an interception. It is being reported this morning that Ben is scheduled to have surgery to repair his broken nose. Ben did have successful surgery to reset his broken nose today! You can watch video highlights from the game here. You can watch video of Ben’s post-game comments here. You can check out photos here. You can read post-game quotes from Ben, his teammates and Coach Tomlin here. Note: Website may experience downtime tomorrow due to work being done on the site’s server.